David Covert, age 95, of Terry. David B. Covert was called home to be with his Lord and Savior on January 21, 2019. David B. Covert was born in Glendive, Montana May 17, 1923, the son of Ray E. Covert and Martha M. Thompson Covert. He passed away at the Billings Clinic Hospital of heart complications. David began his grocery career at age 12 working in a Reynolds Store in Watford, City, ND. After graduation from high school in 1941, he worked in the ship yards in Portland, Oregon prior to entering the US Army in 1943. 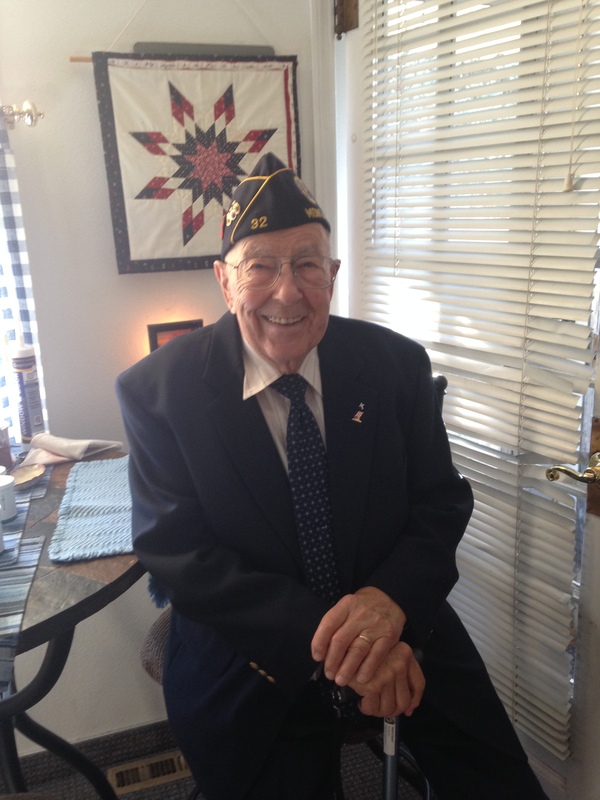 David served his country proudly as a combat infantryman in the European Theater in World War II. After the war was over he returned to Terry and married Lucille M. Jones on November 17, 1946; to this union three children were born: David Kent, Karen Lucille and Connie Jean. Dave managed Reynolds Market until 1966 when he and his father purchased the Reynolds store in Terry, which he operated with his wife until he retired in May, 1990. During those years, the historic store building was remodeled several times including adding 30 feet to the grocery sales room in 1988 when Dave could see it would be to the benefit of his customers to have more shopping space! He was an active leader in the business community for 44 years. He was past President and member of the Terry Chamber of Commerce, a member of the School Board in the 1950’s and a life member of the American Legion. He served on the Terry Volunteer Fire Department for 30 years. He was a Trustee of the Fallon Evangelical church. Dave traveled to Haiti in 1974 on a mission work crusade. As a past Hospital Board member, he helped organize the building of the Prairie County Clinic and remained as a Clinic Board Member from 1960-2005. David enjoyed his life’s work and visiting with his many customers who were also his friends. After retirement, Dave and Lucille traveled to many places in the United States enjoying a number of winters in Arizona. David’s family was very special to him and he was proud of all of them. His parents preceded him in death. Those to mourn his passing are his loving wife of 72 years, Lucille, children: Kent Covert, Karen Covert, Connie (John) Onstad; grandchild Lyle John (Tara) Onstad, great grandchildren Katherine, Andrew and James and grandchild Naomi (Conn) McKelvey and great grandchildren Nora and Nolan. A celebration of Dave’s life will be held at the Terry Community Church on Saturday, January 26 at 11:00 a.m. with lunch to follow. Open Visitation at the Stevenson Funeral Home from 1-6 p.m. on Friday, January 25. Condolences may be sent to the family by visiting: www.stevensonandsons.com. The family suggests that donations in his memory may be made to Operation Smile. We are so saddened to hear of Dave’s passing. I cannot remember a time when Dave wasn’t smiling or encouraging someone. I always knew that he enjoyed my piano playing even though I made mistakes he would be smiling at me and would always be positive. What joy it is to know that he is in the presence of his Lord and Savior. Our prayers will be with you and your family. Our deepest sympathy goes out to Lucille and family. May you find comfort in the Lord as you struggle with Dave’s passing. We know how greatly he will be missed by all that knew him. We extend our condolences to you. We enjoyed our visit with him one of the last times we were in Terry. What a pillar to the community he was & you too, Lucille. My sincere condolences to Lucille and family. Dave was one of the kindest gentlemen I have had the privilege of knowing. He was a good friend to my parents as well. He will be missed in his community, but what a blessing to know that we will one day meet him again in heaven with our Savior. May God grant you all peace during this difficult time. So sorry for your loss. I left Terry in 1972 and this is the person that always came my mind. He was the one that found me crying in the alley by the butcher shop across the street from his store and left his store to take me out of the cold, He carried me into the butcher shop as I had broken my leg. Thank you Dave you were a great man. So sorry to hear about Dave’s passing. He was such a positive, up beat individual. I enjoyed my visits when you came to Miles City to shop, see the doctor. We had the good fortune to meet Dave but it was so great the impression he left on us that we still remember each of the minutes we enjoyed with him and with that fantastic family that treated our daughter Marta so well. We will never forget it. Today is, without any doubt, a sad day for all because a great man who has left a great mark in this world is gone. If you allow us, we want to share that pain with all of you and at the same time the joy of thinking that he already is next to God the Father. Although we are so far in distance we feel ourselves very close to you in these moments. Love & Hugs to all the family! So very sorry to hear of Dave’s passing. Dave played a significant role in helping me pave the path I have followed in my life and I am forever grateful. My sincere condolences go to Lucille and family. We were very sorry to hear of Dave’s passing. Dave was a joy to be around. He always had a sunny outlook, a kind word, and had such an interest in everything. He lived his faith daily and was such a blessing to our church. Our sincere condolences to Lucille and the family. Know that Dave will be missed and long remembered. Our prayers. Sending my deepest condolences to the family of Mr Dave. May you find comfort in the bible’s promise of a future resurrection at Luke 23:43 and Acts 24:15 when you will be reunited with your loved one. But until then, he sleep in peace (John 11:11-14). David Covert Family. Thinking of you as you remember Davids remarkable life. David was always a good friend. I remember David when I was growing up terry. With heartfelt sympathy.